A fascinating story about love and courage set during America's Prohibition. From New York Times bestselling author Jennifer Chiaverini, a powerful and dramatic Prohibition-era story that follows the fortunes of Rosa Diaz Barclay, a woman who plunges into the unknown for the safety of her children and the love of a good but flawed man. As the nation grapples with the strictures of Prohibition, Rosa Barclay lives on a Southern California rye farm with her volatile husband, John, who has lately found another source of income far outside the federal purview. Mother to eight children, Rosa mourns the loss of four who succumbed to the mysterious wasting disease that is now afflicting young Ana and Miguel. Two daughters born of another father are in perfect health. When an act of violence shatters Rosa's resolve to maintain her increasingly dangerous existence, she flees with the children and her precious heirloom quilts to the mesa where she last saw her beloved mother alive. As a flash flood traps them in a treacherous canyon, only one man is brave-or foolhardy-enough to come to their rescue: Lars Jorgenson, Rosa's first love and the father of her healthy daughters. Together they escape to Berkeley, where a leading specialist offers their only hope of saving Ana and Miguel. Here in northern California, they create new identities to protect themselves from Rosa's vengeful husband, the police who seek her for questioning, and the gangsters Lars reported to Prohibition agents-officers representing a department often as corrupt as the Mob itself. Ever mindful that his youthful alcoholism provoked Rosa to spurn him, Lars nevertheless supports Rosa's daring plan to stake their futures on a struggling Sonoma Valley vineyard-despite the recent hardships of local winemakers whose honest labors at viticulture have, through no fault of their own, become illegal. 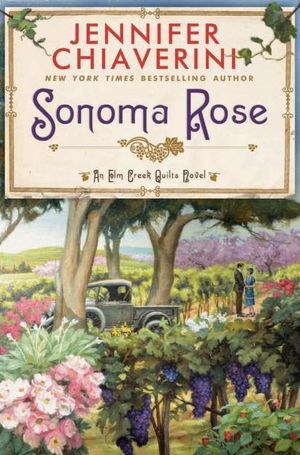 Sonoma Rose by Jennifer Chiaverini is fascinating novel set during Prohibition in the southern United States. I loved the retro cover. It reminded me of many classic novels that I enjoyed so many years ago, or finding an old dusty classic hidden at the back of a library's bookshelf. This novel weaves through time as it follows the trials Rosa and Lars face as they attempt to escape their past and avoid treachery in their new life. One immediately feels sympathy for poor Rose who is trapped in a loveless marriage with an embittered man who refuses to provide the necessary care for her ill children and regularly abuses her. This is an epic story that weaves itself over several years and takes the reader into the heart of wine country during the era of Prohibition. The author gave us an in-depth look at the struggle of vineyard owners at a time when wine-making was severely and how they struggled to survive. Insight was also given as to how celiac disease was first diagnosed and treated. The novel was easy to read. Its characters, both protagonist and antagonist, were well written and realistic. It is nice to learn about lesser known eras in unusual settings, and this novel certainly made that mark. Beautiful prose, rich descriptions, and an endearing story of courage and hope make this an awesome read. I'm glad to see your positive review -- I have this on my review schedule and was apprehensive since it seems to be a part of a series -- one I haven't read yet. But your comments have me relieved and excited about it!